Hardy herbaceous perennial, native to North America, member of the Daisy family, Compositae. The plants bear tiny daisy like white blooms in the summer and has narrow grey green leaves. A butterfly attractor, it is a useful plant for naturalizing and for use as a dried flower as it retains its shape and color. The plants thrive in ordinary well drained soil in a sunny location, but will do well in a partially shaded location. The plants are hardy, being drought tolerant and capable of withstanding temperatures well below freezing. Anaphalis spreads by means fo underground roots and self seeding, so it may be necessary to control in the garden. Plants are easily propagated by sowing seed, but dividing existing plants, or by taking rooted cuttings. Seed should be sown in a prepared bed in the late fall or spring for blooming the next year. To start seed indoors, sow in pots or plug trays in late winter or early spring. Keep moist at 55F. Transplant seedlings when they reach 2 inches in height. Transplant to the garden when all dnager of frost is past. Space 18-24" apart each way. 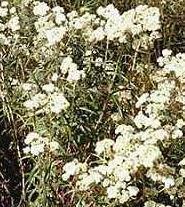 Anaphalis has been medicinally by Native Americans for hundreds of years to treat diarrhea, dynsentery and lung ailments. Poultices of the plant are used to treat burns and bruises, as the plant is mildly antiseptic.